For all plumbing professionals who need to eliminate roots in residential storm pipes, sewer lines, and septic systems, we recommend RootX® as the number one solution for root intrusion. RootX employs a patented formula, which foams when it comes into contact with water. This allows it to reach the top of the pipe, where 90% of the roots are likely to live. Root intrusion can be a huge threat to a residential wastewater system. When roots are left to grow unchecked they will block material, cause a complete obstruction of the pipe, and eventually even destroy a sewer or septic system. 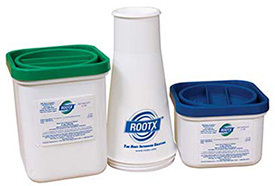 Regular RootX treatments provide a root free system, and possibly prevent thousands of dollars in repairs. When you kill roots in your pipes you restore the pipe flow capacity. When the RootX formula contacts water it begins to foam, allowing it to reach the top of the pipe, where it can kill intruding roots. RootX also uses a degreasing agent to remove grime so that the herbicide in RootX can penetrate the roots directly, and kill them quickly. The dead roots decay, and the pipe is returned to its full flow capacity. RootX will also stick to the pipe’s walls where it will deter root growth for up to 3 years. The active ingredient in RootX is the aquatic herbicide Dichlobenil. RootX is non-fumigating, non-systemic, and non caustic. It does not contain copper sulfate, metam sodium or dibromide. This means that RootX is safe to use for all pipes, septic systems and above ground vegetation. However, it is not for use in septic systems in the state of Florida. RootX is applied simply with no special equipment required. In situations where mechanical cutting will also be necessary, remember to begin the RootX treatment within the first hour after cutting for maximum absorption.